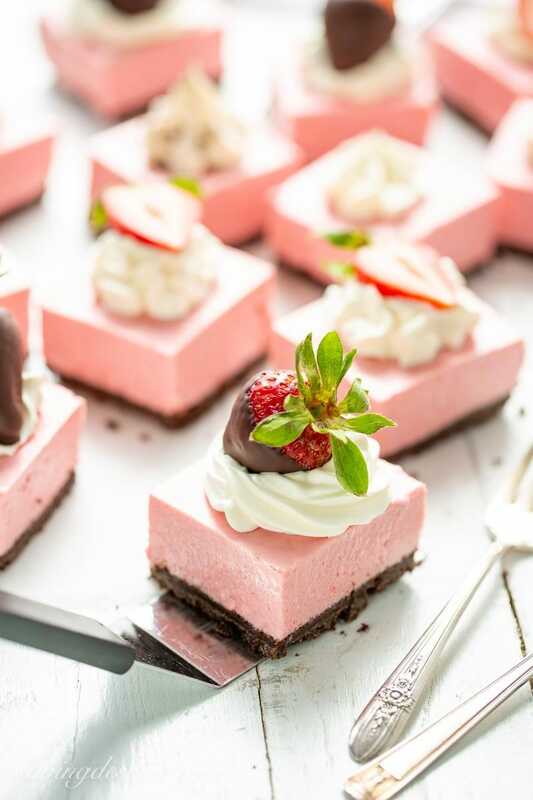 Strawberry Cheesecake Bars – creamy, refreshing, and lightly sweet with an intense strawberry flavor making these deliciously crave-able and perfect for all your summer dessert opportunities! 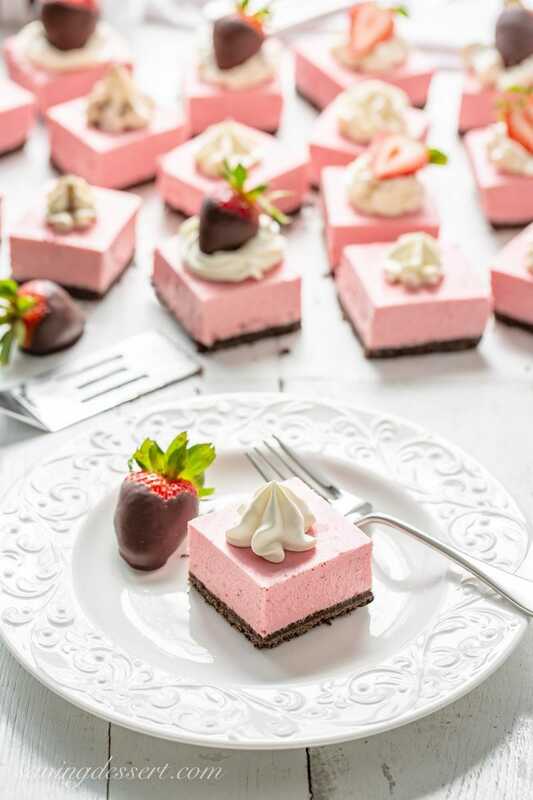 Strawberry flavor is not an afterthought in these delicious Cheesecake Bars. It may seem impossible but these bars have more intense flavor than a strawberry! There are several easy steps used to coax out and concentrate every bit of flavor from the strawberries. While this process takes a little time, each step is easy and detailed in our printable recipe. 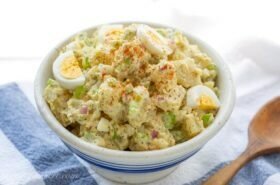 I wish you could see me doing my happy dance, hands in the air celebration for this delicious recipe. Well, maybe I’m glad you can’t see me being all dorky 🙂 Seriously though, everybody loves these bars – and I know you will too! They’re fun to decorate or perfectly delicious with nothing at all. For fun we topped some with chocolate dipped strawberries (yum!) while others were decorated with sweetened whipped cream, crumbled chocolate graham crackers and/or sliced fresh strawberries. 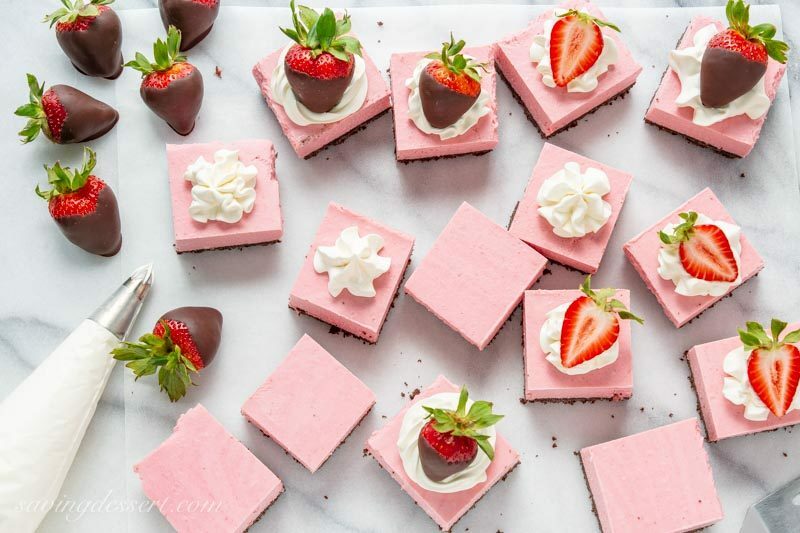 I’ve made these Strawberry Cheesecake Bars in a 13×9-inch baking pan and a 9×9-inch square pan. I prefer the square 9×9 as it yields a thicker filling and more chocolaty crust per bar too! I think this recipe will work in an 8-inch or 9-inch springform pan as well. What a pretty round cake this filling will make! For clean, pretty slices, I put the pan of cheesecake bars in the freezer for about an hour before cutting. Use a large, thin knife, wiping it clean with paper towels in-between each cut. Once cut, the cheesecake bars can frozen for a week or so if desired. This will help keep them pretty if you have to transport the bars to an event or party. Otherwise, store them in the refrigerator until served. The filling is very soft, silky and practically melts in your mouth. That doesn’t mean they’re too soft and that they’ll fall apart. 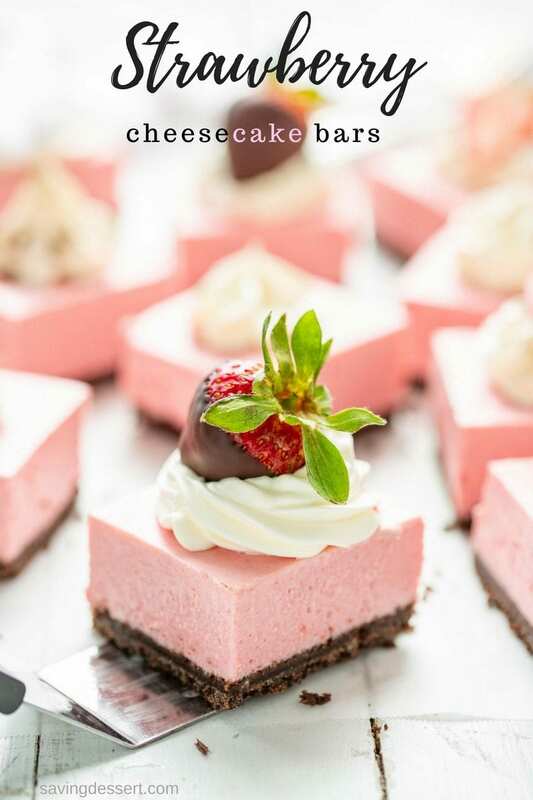 These cheesecake bars have an almost mousse-like texture and hold together beautifully with the addition of plain gelatin and just the right amount of cream cheese. The filling is eggless and does not require baking, just refrigeration. The graham cracker crust doesn’t have to be baked either, but in our recipe testing we found that it stayed together much better when it was. 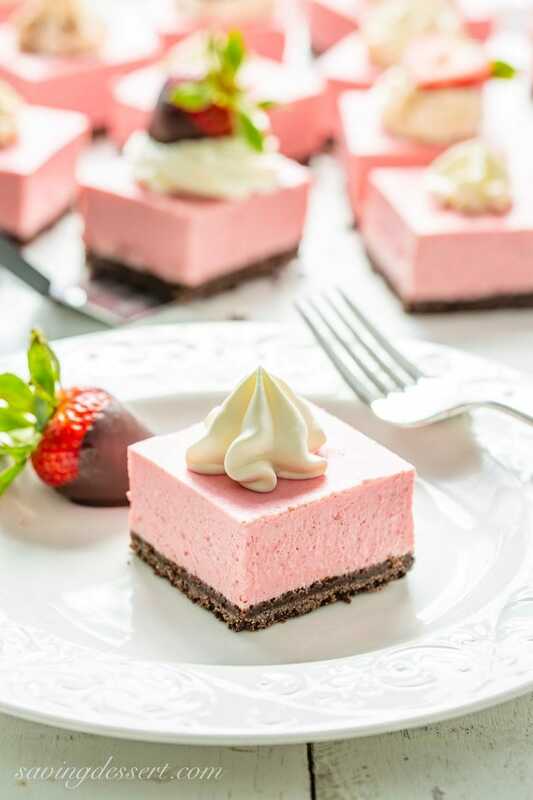 Creamy, refreshing, and lightly sweet with an intense strawberry flavor making these perfect for all your summer get-togethers! Preheat oven to 350F. Cut a length of parchment paper to fit a 9x9-inch baking pan allowing the paper to come up to the top on two opposite sides. Cut another sheet to fix in the opposite direction. Set aside. In the bowl of a food processor, combine the graham crackers and sugar and process until finely crushed. Add the melted butter and pulse until well mixed. Firmly press the mixture onto the bottom and sides of the prepared pan. Bake for 8 minutes at 350F. Remove from the oven and cool. Once cool, put the pan in the refrigerator will preparing the filling. Clean 2 pounds of strawberries and remove the hulls. Cut each in half or quarters. Process half of the strawberries in a food processor until pieces are 1/4 to 1/2 inch thick – about 10 short pulses. Repeat with the remaining strawberries. Be careful not to over-process the strawberries. Place the processed strawberries in a medium mixing bowl and toss with 1/2 cup of the sugar and a pinch of salt. Cover and allow the strawberries to rest for 45 minutes, stirring occasionally. Don’t wash the food processor yet – you’ll need it again in a few minutes. Strain the now macerated strawberries through a fine-mesh sieve into a large mixing bowl. You should have about 2/3 to 3/4 cup of juice. Remove 4 tablespoons of the juice to a small shallow bowl. Sprinkle the unflavored gelatin evenly on top of the juice and set aside. Place the remaining strawberry juice in a small saucepan. Heat on medium-high heat until it begins to boil. Reduce the heat to medium-low and simmer until the juice is reduced to about 3 tablespoons, about 10 minutes (watch the syrup carefully!). The syrup is done when it becomes a little darker and thicker. Watch the strawberry sauce carefully as it will bubble up and may overflow the pan if boiling too fast. Place a wooden spoon across the top of the pan to help prevent a mess. Remove the saucepan from the heat and stir in the remaining 1/4 cup sugar, until dissolved. Add the softened gelatin and stir gently until combined. Set aside. While the syrup is cooking down, take the strained strawberries back to the food processor and pulse until very smooth. Strain through the fine mesh sieve again using a large spoon or rubber spatula to press the solids through and extract all the juice. Once all the pulp and juice is extracted, discard the seeds and any remaining solids. Add the cream cheese to the strawberry puree and using an electric mixer, blend on low until smooth. Pour the gelatin mixture into the cream cheese mixture and whisk (do not beat) until fully blended. Pour the strawberry filling over the cooled chocolate graham cracker crust. Refrigerate for at least 4 hours or overnight. To cut pretty pieces, place the pan in the freezer for about an hour before slicing. Carefully remove the lightly frozen cheesecake to a cutting board using the parchment paper for handles. 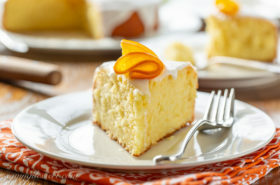 Using a large thin knife, slice the cheesecake into 16 equal pieces wiping the knife clean between cuts. Garnish with whipped cream, sliced strawberries or chocolate dipped strawberries as desired. Serve. Once cut, the bars can be stored in the freezer for up to a week. Allow them to sit at room temperature for 45-60 minutes before serving. Pour the whipping cream in a small bowl. Beat on medium with an electric mixer until foamy. Add the sugar and beat on high until lightly stiff peaks form. Pipe onto sliced cheesecake bars using a large star tip if desired. To make chocolate dipped strawberries: wash strawberries making sure they are completely dry before dipping. Melt the chocolate in a heat-proof bowl over hot, but not boiling water. Stir frequently until smooth. Turn the heating element off, but keep the bowl set over the hot water. Dip the strawberries and shake off any excess chocolate. Place on a wax paper lined plate or baking sheet. Refrigerate until needed. Tip: Spread any leftover melted chocolate onto graham crackers or wafer cookies. Refrigerate to keep fresh for up to 1 week. Makes great ready-made s’mores! Use regular graham crackers instead of chocolate if you prefer. I hate to waste anything so when baking I always look for ways to use leftovers. Too much icing for the cake? Sandwich a thick layer of icing between two graham crackers and keep in the freezer for when you need a sweet treat. Leftover chocolate after dipping strawberries? 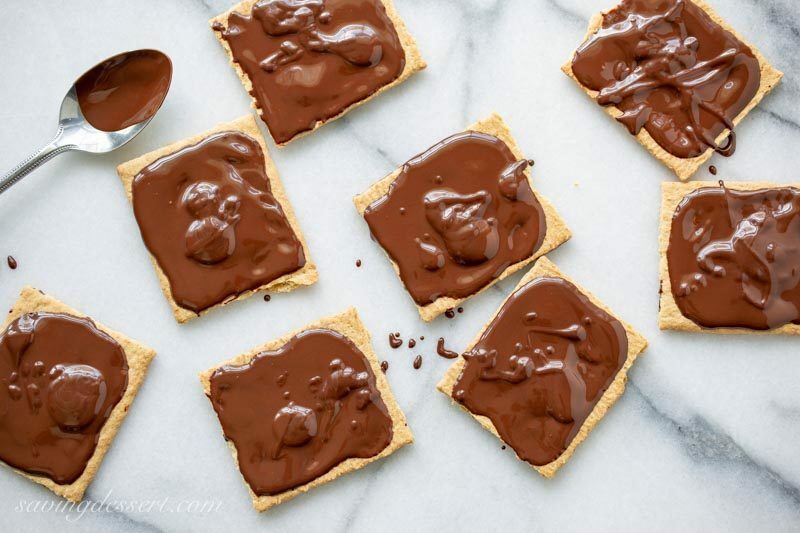 Smear on graham crackers and refrigerate until set – ready for s’mores! If you love strawberries as much as we love strawberries, I know you’ll want to try our Easy Strawberry Sorbet Recipe made with only 3 ingredients! Check out this recipe for Easy Small-Batch Strawberry Jam recipe and use it to make our Homemade Strawberry PopTarts too! My goodness, they are pretty, Tricia! I love absolutely everything about these including your tip for using leftover chocolate on the graham crackers for a future treat 🙂 Winner-Pinner! Thanks Susan 🙂 And thanks for pinning! How gorgeous, just perfect for a summer party because you can make it ahead. Pinned! 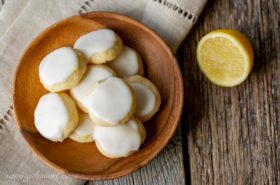 I love make ahead desserts Gerlinde 🙂 My family was not at all upset when I made these multiple times to properly test the recipe – haha! Wow, these are picture perfect! What a delicious way to celebrate local strawberries! Pinned, of course! Thanks Liz – and thanks for pinning! What a terrific looking dish — just gorgeous. And I’ll bet the flavor is insanely good. One of the best strawberry dishes I’ve seen — thanks. Beautiful photos. I particularly love the landscape on with certain bars piped, and with strawberries! 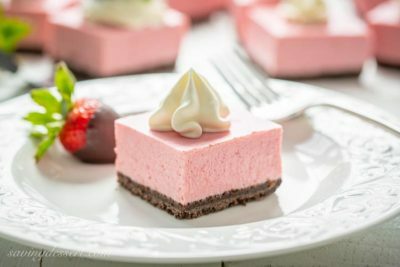 I just love pink desserts! My mom used to make a chocolate mousse also with gelatin. I do love the use of chocolate grahams! The best part is the real strawberries for the filling! I bet it tastes divine! Thanks Abbe! 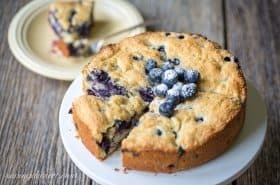 I love that you really can’t tell there is gelatin in this recipe – it helps hold it together without being jello-ish – haha. Plenty of fresh strawberries in this recipe for sure. I’m doing a happy dance too, just looking at these beautiful bars! I will be stopping for local strawberries soon! Our local farm just opened for picking – more strawberry recipes to come! Thank you Sue – these are fun to make and decorate. Hope you had a good Mother’s Day. Thanks Jennifer – we agree! 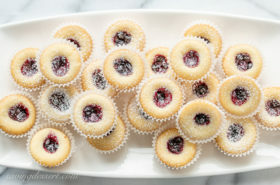 They are perfectly perfect light, delicious and beautiful, Tricia!